Warm memories, adventure and hints of times gone past. It took me awhile to finish this one because I liked it too much to do it quickly. 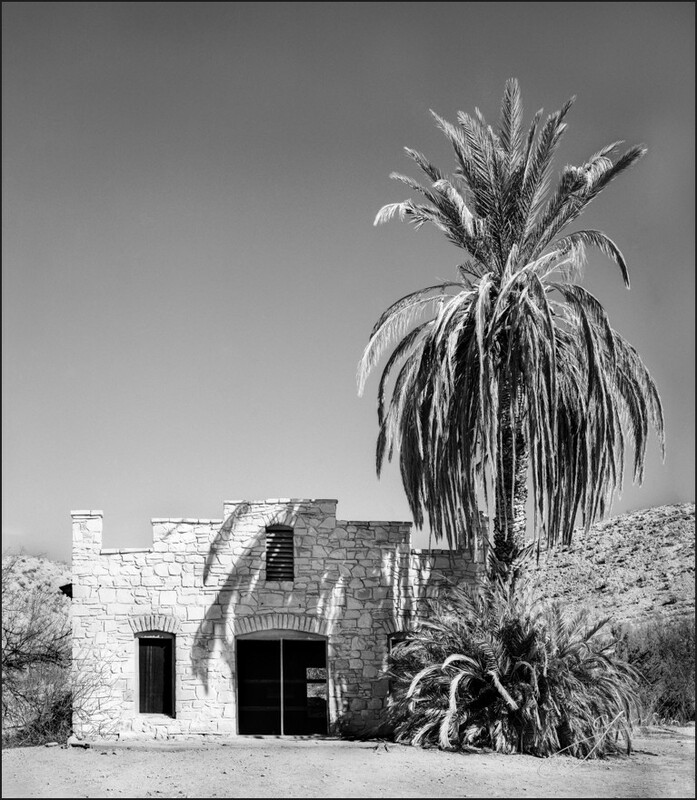 This old store sits in the middle of the desert a few minutes walk from the Rio Grande, Mexico on the other side. Down the path a ten minute hike is the ruins of the old Hot Springs, self proclaimed healing waters that made this old resort an attraction. Now it’s just a dusty path leading to the warm hot tub like foundation that still remains from the old bathhouse and is filled by naturally hot water. 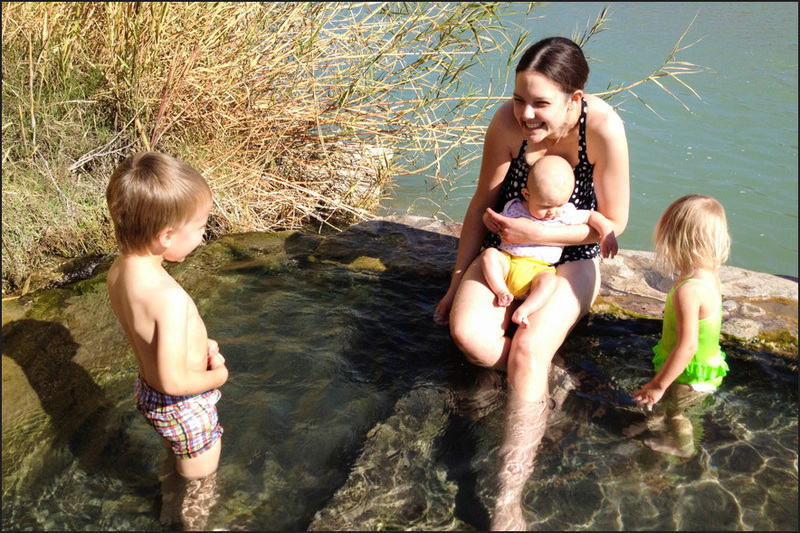 The whole family and I went down and we soaked together in the warm spring as a tiny Mexican village lumbered through the day across the river. There a lot of history in this old place and it’s memories are just a little haunting, especially when the tourists disappear for the day and the solitude of morning or evening take over the silent stones. Notes Snapshot: Down past the old buildings lie the ruins of the old hot springs building. It’s remaining foundation makes it like a hot tub in the middle of the desert. The family and I enjoyed it – This is Cyrus, Asher, Ana and my wife, Sondra. Large format was perfect for this and the medium gave a pure richness like no other. The movements on the camera helped me stay in control of perspective and the detail did justice to the vivid contrasts and shadows of the morning sun. I scanned in the resulting file, but my chemical process was not perfect and I needed to do some cleanup. From small bits of dust and scratches on the negative. Large format has a problem with this because the negatives are so large. I just keep working to refine my process and keep them as clean as possible. Another issue is the pure open sky. I did a bit of filtering to keep richness in the blues using a Yellow 12. My dynamic range was fine, but perfect gradients require perfect processing. I got some water spots from not developing as perfectly as I should have and between that and the blemishes I had to spend some time refining and maintaining the sky wheres everything shows. It was unusually hard. In truth digital also has a real problem here and much of my headaches came from that. Smooth gradients band very easily in digital, so even though I started on film which offers perfect gradients in tone and or color, scanning to digital and then having to work on the image left open opportunity for problems. Especially as such high resolution where oddly banding seems to get worse. After I cleaned up I worked on final tones. As I often do in silver I wanted to bring our the full range of values from Zone 1 (almost black) to Zone 9+ (almost white). Doing this kept a richness to the image that took advantage of the somewhat harsh light, showcasing the amazing detail in stones and palm leaves leaving the shadows sharp and crisp. In the end I really enjoy the image. Part of me wonders if some puffy clouds would have been nice, but then those could have distracted from the rich sense of contrast. In the end I cropped to keep the sky small and focus on the real story, the forgotten old resort sitting in the middle of a hot desert. How Much? A detail drop if the image. 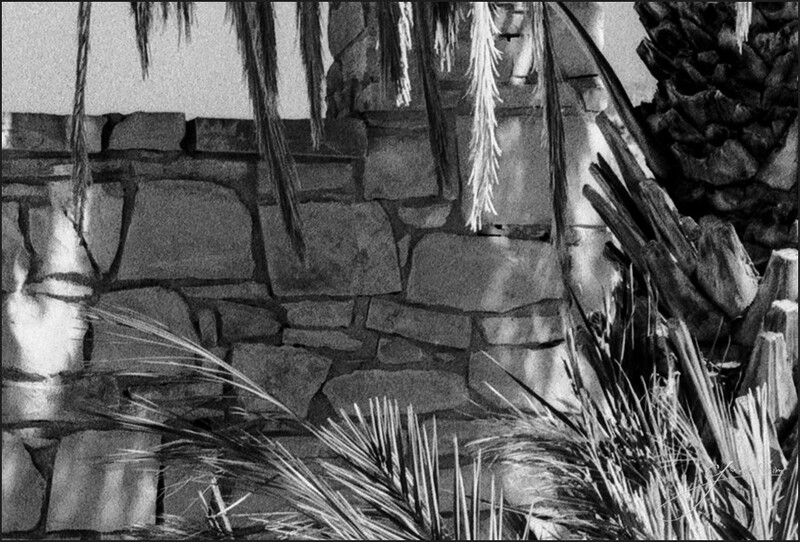 the 4×5 film provided astounding nuances and detail throughout. The finished image is about 85 megapixels after final crops. This entry was posted in 4x5, beauty, f164, Fine Art, journal, line, National Park, nature, signature, silver, technique and tagged 4x5, big bend national park, black and white, contrast, f164, film, ghost town, movments, national parks, palm, ruins, silver, stone, sunlight. Bookmark the permalink.